Hello there, today we are celebrating the release of the June MMH Kit. Let me tell you, it is fabulous! Like I mentioned in my post on Saturday, it is safari themed and boy, it is stunning! I loved creating my tag so much, that I have decided to share a similar project with you today, but this time a card. I apologise that it is so similar to the tag, but I am in love with the look of these stunning stamps against the sunset. For the hop, you should have arrived here from the amazing, Ilina but if you get lost along the way, I have a full list of participants below. For my card, I started off with a panel of Bristol Smooth cardstock. I took one of the circle dies from the Circles Infinity Die collection and cut this from some masking paper. I added the mask paper to the panel and then blended ink inside. I used Mustard Seed, Spiced Marmalade, Abandoned Coral and Seedless Preserves Distress inks. As you can see I started with the lighter shade at the top and blended up to the darkest. The added Seedless Preserves just darkens the top slightly. 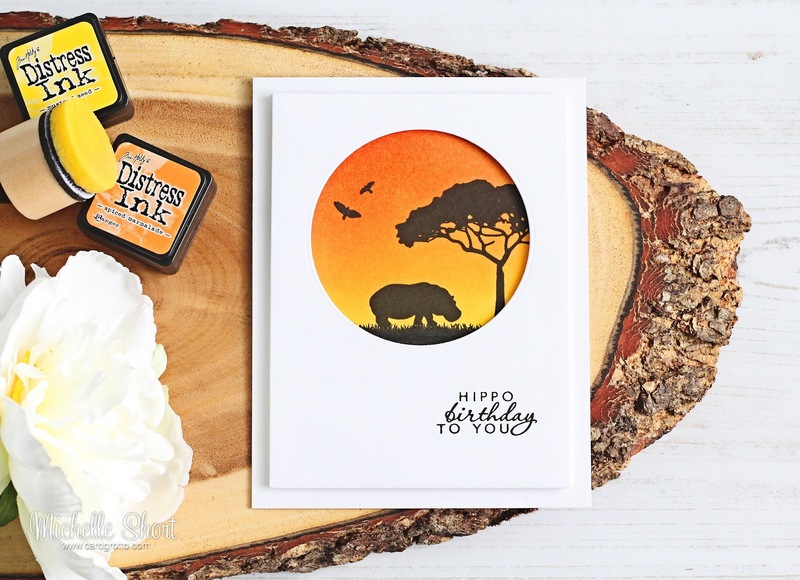 Using a MISTI, I stamped the hippo, tree, grass and birds on to the sunset using black ink. I double stamped these to get a really dark impression. This panel was added to a white A2 card base with tape. I then took one of the Rectangle Infinity Dies and die cut this from more white cardstock. I then cut another circle in to this to create a window. I stamped the sentiment, from the same main stamp set that you get in the kit, to the bottom right. This panel was then added to the card with foam tape. A really simple design but I have to say, I love how it turned out! That is an amazing $73 worth of products for only $34.99 (approx. £28.00) Remember that the kit is limited edition and they often sell out really quickly, so grab one while you can. You can purchase it HERE. You can also subscribe to the kit so that you never miss out on one. 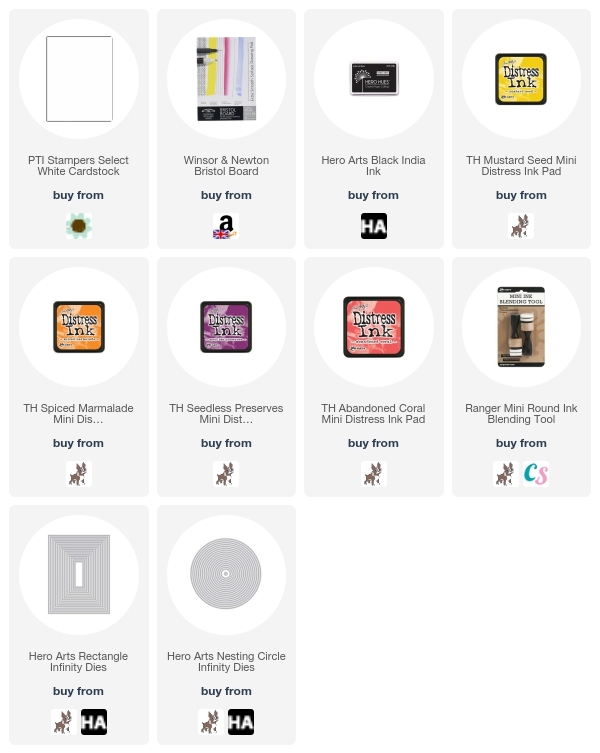 Hero Arts are giving away one kit as a prize to one blog reader. The winner will be selected from the comments across all of the blogs in the hop. So the more you comment, the better the chance of winning! (If the winner has already bought the kit, they will be reimbursed for it). Giveaway closes Sunday, June 11th at 23.59 hrs and the winner will be announced the following week. The next person in the hop is the amazing, Clare. Thanks so much for visiting me today. I hope you have a great rest of the day and have had a great time on the hop so far! This card is beautiful! Something masculine. What a beautiful scene, love your card. Very beautiful card. Love the background colours. Love your card, those colors with all that white space....GORGEOUS!!! Your card is just lovely! I really like how you cut the circle into the front of the card. Love the hippo and the sunset look! Thank you so much for sharing! This hippo! He's so cute! I love this card! Your card is lovely! I really like that you used white paper - it really sets off the sunset you created. Thank you and Hero Arts for the chance to win! The background sunset you created is so beautiful! Beautiful ink blending, and a beautiful card. Thanks for the inspiration! Beautiful card. Love the blending. Great cards, love the kit! This kit is just amazing! So beautiful! The card is gorgeous. I really love simple card designs. I think they are the most stunning and this is no exception. Thanks for the inspiration! Your card is stunning. Love the vibrant background. Beautiful! I like the clean white card with the colorful design within the circle. This is very sweet. Thanks for sharing! Nice clean and simple card. Such an amazing card kit. Such a beautiful Safari silhouette with the hippo! It's an amazing card! Love how it turned out! Pretty card, your sunset is beautiful! Cute card with a great background. Nice clean card! Love it! Lovely card! I'm really liking the sunsets with these silhouettes. The kit is amazing this month. I love all the cards created. I just love what all the designers come up with. love love love this card! all the white and the hippo stamp, just beautiful! 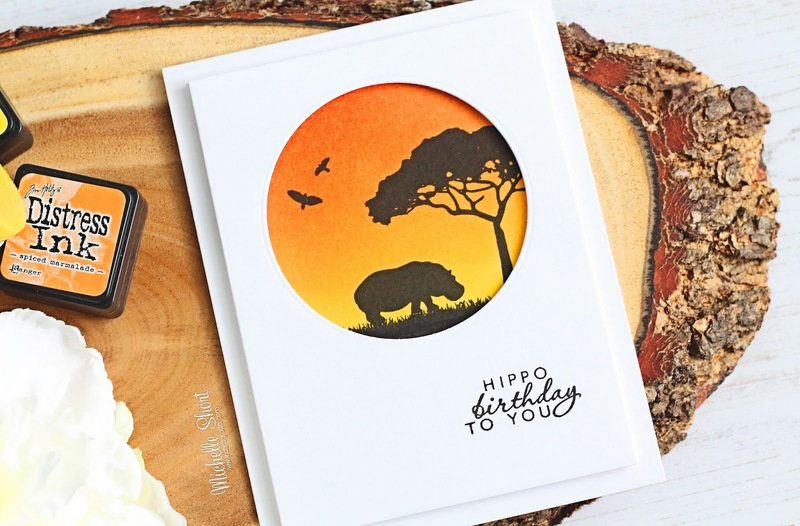 You captured hippo beauty in you colorful sunset card! Beautiful card! I can't wait to get my kit and try this. the safari I went on in 2012. This is an amazing kit and you have made a wonderful card with it. The colors almost make you feel the heat! Cute card with a great sentiment. I love your card hippos are so cute. What a beautiful sunset scene. Love your card. Love this kit. Already bought it! A wonderful card! Love the kit. This kit has so many possibilities with fun colors and images. All the cards on the hop have been so cute. I, just, LOVE the silhouettes in that sunset! Nice card. The contrast between the clean white base and the sunrise scene is striking. Beautiful background and card design! Beautiful card! Love how the silhouette sunset pops against the clean white circle cardstock. Such a gorgeous birthday card! What an amazing kit this month! This is an amazing kit! So many animals!! I'm loving the bright background! What a pretty scene you created!! Wow your card is stunning!! I am so glad I bought this kit! Love your sunset design. Loved your tag, too. Such a great kit. I can't wait to get it. Cute idea, thanks for sharing! Great cards! They are so original. Beautiful CAS safari scene card, LOVE! Love the Hippo silhouette, beautiful card. 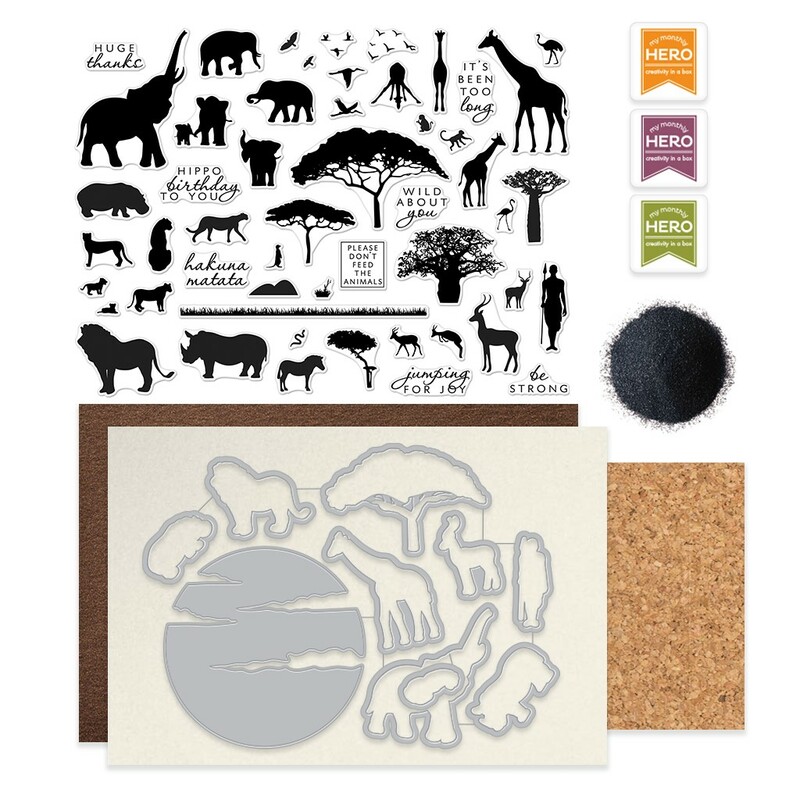 Great card, awesome June Release, I love the African animals & trees! Your card is breathtaking. This is an amazing kit. I can't wait to get mine. I love this Card. I am kinda obsessed with hippos right now. And not only does your card have a hippo on it but my favorite colors. Thanks so much for sharing!! Gorjus card! Love this set! Hero Arts has been on a roll! A terrific card, Michelle. Love how you combine artsy and humor in one creation, Like the shadow box effect - really cool! Great cart, would like to get that for my birthday. So glad I got this kit before it sold out! You always put out a terrific product. I've been watching you on YouTube for about 6 months and love seeing you do your work on camera. I hope you get your room done, so you can make some more videos. Can't wait to see your next one. Lovely cards, thanks for some great ideas! Been looking for a hippo stamp - found it. Thanks for sharing your wonderful card design. Love the burst of color of your night skies on this clean and simple cards. I can see a wonderful card set using different animals with this card layout and style as the inspiration. Great background colors with the distress ink! Love your card! I just love all that white space with a pop of color as the central focus point! Stunning! I had to laugh at your sentiment! Loved the card. Fingers crossed that I can win the kit since I didn't manage to get one. Beautiful card and colors. The silhouette die is such a strong great feel and love the hippo. So creative. Great card! The background really pops with the white front! What a pretty birthday card. This kit and everyone's work are so inspiring. Thank you for sharing your talent with us. Very pretty. Just can't go wrong with such a beautiful kit. So many possibilities. This kit is awesome! This has been the best kit and monthly blog hop! Please make more HA!! There are so many of us who would buy and love them, hence the quick sell out. I love the use of distress inks for the sunset backgrounds! The tag is adorbs also! Great card ! Love the ink blended look. Very nice. This is gorgeous, Michelle!!! Really love your card and I wish I could get my hands on this kit!!! Love your great card!! Too bad the kit has sold out! This hop seems to have been a tease since we cannot get the kit after seeing all the beautiful inspiration. This is a great kit. I love your card. The sunset is stunning. The safari theme is a favorite of mine. Wow! One of the most beautiful kit!!! Love so much how you created a perfect and magical jungle scene!!! Love, lovee, love!!! Such a great card. I love the hippo scene. Thanks for sharing..
Love your card. I would love to have this kit. What a fun kit. Love all your ideas! I love the sunset colors and am so glad to get so many ideas for it. This is such a wonderful release. I love your card -- the coloring and the style is gorgeous. Such a beautiful card. I love that this set can be easily used for masculine cards. Absolutely stunning card! Love the background! Beautiful card--the background is gorgeous! Gorgeous card! I love everything about it! Amazing kit this month! Great card. I love that you used the hippo! Love your beautiful creation! Thank you for sharing. Sunset is pretty recessed, nice are! Darling hippo card, Michelle! Just love the sunset circle scene you created!! The Hippos were my favorite when we went to Africa! Your card is just lovely! I love the silhouettes in this kit and would use this set to pieces, as it would make the perfect addition to my Africa scrapbook, as well as masculine cards. Those are hard to make sometimes. Thanks so much! Loved your card. Especially using an animal that is not often used on a birthday card. Brilliant. Thanks for sharing. Cute, "punny" sentiment on your lovely card! Beautiful coloured background. The silhouette look is simple looking but effective. Simply gorgeous card...love your incredible background, stunning! Very nice card. I like the sunset background. This is a fun card! I like this idea for masculine cards! Beautiful card and i love the simplicity of it. Gorgeous. Gorgeous card! I love the color you use. Love, love, love!!! Your card hit it out of the park. Beautiful! Your card is beautiful (as was your tag)! And I just love that cute sentiment! Beautiful card, your ink blended sky is so pretty! Very nice, I can do this, thanks for the creative ideas. What a beautiful card! Adore how the vivid sunset is surrounded by the fresh white, and the small black sentiment. It's simply but stunning! Thanks so much for sharing! Lovely card, and the kit is amazing! just beautiful..hope I win, the kit is sold out already. Gorgeous! I love the window look. Beautiful! I need this kit. Oh, a hippo, I love hippos! What a lovely card you made! Gorgeous sky colors for your beautiful silhouette card! Very beautiful card- I can't get enough of the sunset! I wish this kit was still available. I really wanted it. :( Beautiful card! Michelle I love the sunset background that really POPS with the white card! What a cute hippo too! This sunset us so pretty that you can almost feel the warmth of the sun. I love how versatile this kit is and how the card examples show so many styles for the stamps and dies. Such a nice card! A beautiful sunset and I like that you used the hippo! Love this kit! You made an awesome card. Thanks for sharing! I love this clean and simple card! I would love to win this set since it is already sold out! I hope they will release the animal stamp set to be purchased in the near future. I love love the animal silhouettes. Beautiful card!! Great colours and blending of them. love those sunsets with the dies! Great card- love the colors and design!This is a fantastic kit ! I just got the "hippo birthday" !!! Love the subtle humor on what could be a serious card! Thanks for sharing! What a stunner! Your blending is so good. Loving this kit. This is a fabulous kit, it sold out so quickly, I hope that they can find a way to bring it back, in the meantime.....cheer for the happy winner! The beautiful background is perfect for this stamps set. Nicely blended and all fits well in the cutout for great dimension. Great card! Lovely card and beautiful background. Love the kit! I don't blame you one bit for loving the tree and animals against the gorgeous sunset! I am totally blown away by this kit and wish that I hadn't missed my chance to purchase it literally by seconds! I had clicked over to check my bank balance and the instant I was getting ready to hit the buy button it went to "out of stock "! I almost cried because I was so excited to be able to get this amazing kit! I guess now my only hope is to be that one lucky random person out of hundreds and hundreds of hopeful people! Your card is a stunning work of art and I love it! TFS! You ladies are rocking this kit and release. I love all the yellow and orange colors highlighted with the black animal accents. So awesome. Great colors and love the design! Gorgeous clean card, Michelle!! Thanks for the wonderful inspiration!